People with diabetes should receive nutrition counselling by a registered dietitian to lower A1C levels [Grade B, Level 2, for those with type 2 diabetes; Grade D, Consensus, for type 1 diabetes] and to reduce hospitalization rates [Grade C, Level 3]. Nutrition education is effective when delivered in either a small group or a one-on-one setting [Grade B, Level 2]. Group education should incorporate adult education principles, such as hands-on activities, problem solving, role playing and group discussions [Grade B, Level 2]. Individual counselling may be preferable for people of lower socioeconomic status. Culturally sensitive peer education can improve A1C, nutrition knowledge and diabetes self-management, and web-based care management has been shown to improve glycemic control. Individuals with diabetes should be encouraged to follow Eating Well with Canada's Food Guide in order to meet their nutritional needs [Grade D, Consensus]. Nutrition therapy and meal planning should be individualized to accommodate the individual's age, type and duration of diabetes, concurrent medical therapies, treatment goals, values, preferences, needs, culture, lifestyle, economic status, activity level, readiness to change and abilities. An estimated 80% to 90% of people with type 2 diabetes are overweight or obese. In overweight or obese people with diabetes, a nutritionally balanced, calorie-reduced diet should be followed to achieve and maintain a lower, healthier body weight [Grade A, Level 1A]. Weight loss of 5% to 10% of initial body weight can substantially improve insulin sensitivity, glycemic control, hypertension and dyslipidemia in people with type 2 diabetes and those at risk for type 2 diabetes. 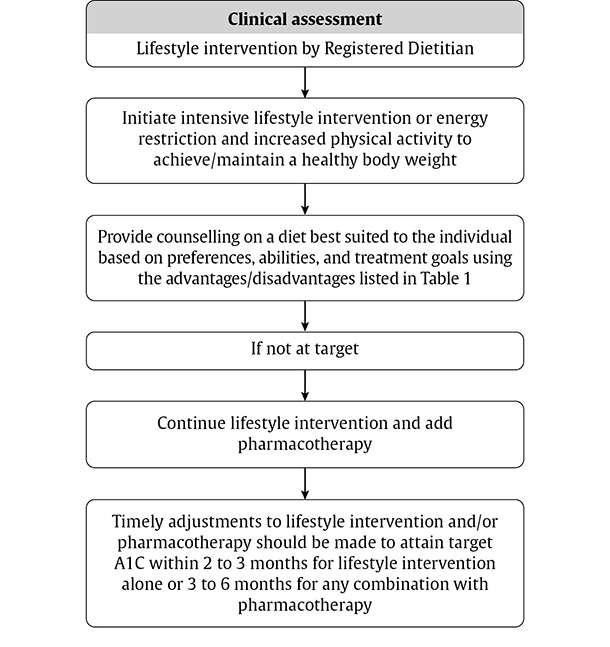 Long-term follow-up of 7 to 10 years of intensive lifestyle intervention (ILI) programs targeting 5% to 7% weight loss in people at risk for type 2 diabetes suggests that there is some weight regain following discontinuation of the intervention, although the diabetes prevention benefits persist. Total calories should reflect the weight management goals for overweight and obese people with diabetes. 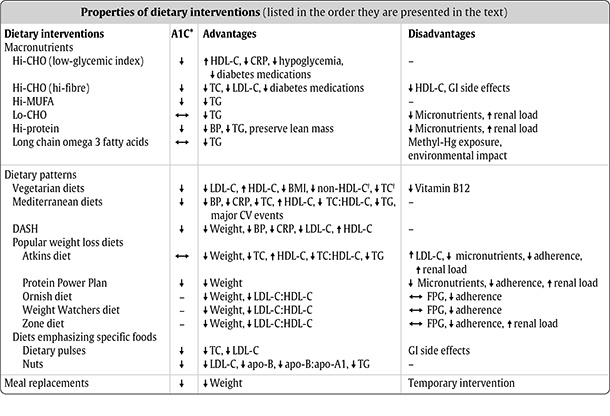 The ideal macronutrient distribution for the management of diabetes may vary, depending on the quality of the various macronutrients, the goals of the dietary regimen and the individual's preferences and lifestyle. The current recommended minimum intake for CHO is not less than 130 g/day (or no less than 45% of total daily energy), to provide glucose to the brain. Dietary advice may emphasize choosing carbohydrate food sources with a low glycemic index to help optimize glycemic control [type 1 diabetes: Grade B, Level 2; type 2 diabetes: Grade B, Level 2]. The GI provides an assessment of the quality of CHO-containing foods based on their ability to raise blood glucose (BG). To decrease the glycemic response to dietary intake, low-GI CHO foods are exchanged for high-GI CHO foods. Low-GI food sources include beans, peas, lentils, pasta, pumpernickel or rye breads, parboiled rice, bulgur, barley, oats, quinoa and temperate fruit (apples, pears, oranges, peaches, plums, apricots, cherries, berries). Higher-GI food sources include white or whole wheat bread, potatoes, highly extruded or crispy puffed breakfast cereals (corn flakes, puffed rice, puffed oats, puffed wheat), and tropical fruit (pineapple, mango, papaya, cantaloupe, watermelon). More detailed lists can be found in the International Tables of Glycemic Index and Glycemic Load Values. Meta-analyses have shown that consuming a low-GI diet can sustain improvements in glycemic control and high-density lipoprotein cholesterol (HDL-C) compared with a high cereal fibre diet over 6 months, and improve beta-cell function compared with a low-CHO, high monounsaturated fat diet over 1 year in people with type 2 diabetes. Evidence suggests that soluble dietary fibre (e.g. eggplant, okra, psyllium, etc.) slows gastric emptying and delays the absorption of glucose in the small intestine, thereby improving postprandial BG control. Cohort studies demonstrate that diets high in dietary fibre, especially cereal fibre, are associated with a decreased risk of cardiovascular disease. Due to the beneficial effects, recommended intake of dietary fibre in people with diabetes (25 to 50 g/day or 15 to 25 g per 1000 kcal) is higher than recommended for the general population (25 g and 38 g of fibre for women and men, and 21 g and 30 g for women and men over 51 years, respectively). Added sucrose or added fructose can be substituted for other carbohydrates as part of mixed meals up to a maximum of 10% of total daily energy intake, provided adequate control of BG and lipids is maintained [Grade C, Level 3]. Studies have shown that consumption of added fructose in place of equal amounts of other sources of CHO (mainly starch or sucrose) is unlikely to have any harmful effect on body weight, blood pressure or uric acid, and may even lower A1C in people with diabetes. However, at doeses >60 g/day or >10% of total daily energy, fructose may have a small triglyceride (TG)-raising effect in people with type 2 diabetes. Eating Well with Canada's Food Guide recommends up to 7 to 10 servings of vegetables and fruit per day. Consuming naturally occurring fructose obtained from fruit does not show evidence of harm. Encouraging low-GI fruit over high-GI fruit as sources of small doses of fructose also provided glycemic benefit without adverse metabolic effects in people with type 2 diabetes over 6 months. Current recommendations for the general population to consume fats in the range of 20% to 35% of energy intake apply equally to people with diabetes. Adults with diabetes should consume no more than 7% of total daily energy from saturated fats (SFA) [Grade D, Consensus] and should limit intake of trans fatty acids to a minimum [Grade D, Consensus]. Meals should favour fats rich in monounsaturated fatty acids (MUFA) (e.g. olive oil, canola oil) for up to 20% of total calories. Polyunsaturated fats (PUFA), such as plant oils (e.g. canola, walnut, flax, salba) and long-chain omega-3 fatty acids (e.g. fatty fish) should be included in the diet up to 10% of total energy intake. A comprehensive review found that although long-chain omega-3 fatty acids from fish oils do not show an effect on glycemic control, these fatty acids do improve lipid profile, modify platelet aggregation and decrease cardiovascular mortality in people with diabetes. However, there remains uncertainty regarding the benefits of supplementation with omega-3 LC-PUFAs. The Outcome Reduction with Initial Glargine Intervention (ORIGIN) trial failed to show a cardiovascular or mortality benefit of supplementation with omega-3 LC-PUFAs in 12 536 people with or at risk for diabetes. There is no evidence that the usual protein intake for most individuals (1 to 1.5 g per kg body weight per day), representing 15% to 20% of total energy intake, needs to be modified for people with diabetes. In people with diabetes who have chronic kidney disease (CKD), the recommended dietary allowance (RDA) of 0.8 g per kilogram body weight per day should not be exceeded, as there is some evidence that this level of restriction leads to reductions in end stage renal disease, mortality, as well as improvements in albuminuria or proteinuria and A1C. Replacement of red meat with either chicken, plant protein (e.g. soy) or a low-protein diet with vegetable and dairy sources of protein has also been shown to result in reductions in albuminuria. In patients with diabetes and CKD on low-protein diets or in those incorporating more plant sources of protein, closer clinical and laboratory monitoring may be required to ensure they are meeting adequate nutritional requirements. The ideal macronutrient distribution for the management of diabetes may need to be individualized based on individual preferences and perceived palatability. Replacing fat with refined CHOs should be avoided as it has been shown to elevate fasting insulin, TG, postprandial glucose and insulin concentrations and to lower HDL-C.
A 15% increase of energy from dietary protein with a parallel decrease in fat, while maintaining CHO intake constant, does not affect postprandial plasma glucose and insulin concentrations in obese individuals with type 2 diabetes and, over 4 weeks, improves TG and blood pressure. There may be benefit of replacing SFAs with PUFAs. Studies have shown that replacing SFAs with PUFAs can result in a 19% reduction in myocardial infarction (MI) or coronary heart disease (CHD) death in people with and without CHD, in which some of the trials included people with diabetes. This result was supported by a pooled analysis of prospective cohort studies, which showed similar reductions in the risk of CHD in people without diabetes. These benefits were not seen if SFAs were replaced with MUFAs. ILI programs in diabetes usually consist of behavioural interventions combining dietary modification and increased physical activity. An ILI program combining dietary modification and increased physical activity may be used to achieve weight loss and improvements in glycemic control and cardiovascular risk factors [Grade A, Level 1A]. A multidisciplinary team, including RDs, nurses and kinesiologists, usually leads the ILI programs, with the intensity of follow-up varying from weekly to every 3 months with gradually decreasing contact as programs progress. Large, randomized, clinical trials have shown benefit of ILI programs using different lifestyle approaches in diabetes. Twenty-year follow-up of the China Da Qing Diabetes Prevention Outcome Study showed that 6 years of an ILI program targeting an increase in vegetable intake, decrease in alcohol and sugar intake, weight loss through energy restriction in overweight and obese participants, and an increase in leisure-time physical activity reduced severe retinopathy by 47%. Interim analyses of the Look AHEAD (Action for Health in Diabetes) trial have shown that an ILI program targeting at least a 7% weight loss through energy restriction (1200 to 1800 total kcal/day based on initial weight), fat reduction (<30% of energy as total fat and <10% as saturated fat), an increase in protein (≥15% of energy) and an increase in physical activity (175 min/week with an intensity similar to brisk walking) produced sustained weight loss and improvements in fitness, glycemic control and cardiovascular risk factors (blood pressure, TG and HDL-C) . However, there was no decrease in occurrence of CV events. There are now several large studies that have suggested that a variety of dietary patterns are beneficial for people with diabetes. An individual's values, preferences and abilities may influence the decisions to use these dietary patterns. A calorie-restricted vegetarian diet was shown to improve body mass index (BMI) and low-density lipoprotein (LDL-C) more than a conventional diet in people with type 2 diabetes. While both diets were effective in reducing A1C, more participants on the vegetarian diet had a decrease in diabetes medications compared to those on the conventional diet (43% vs. 5%, respectively). General features of a Mediterranean diet include a high consumption of fruits, vegetables, legumes, nuts, seeds, cereals and whole grains; moderate-to-high consumption of olive oil (as the principal source of fat); low to moderate consumption of dairy products, fish and poultry; and low consumption of red meat, as well as low to moderate consumption of wine, mainly during meals. Evidence suggests that a Mediterranean-style diet can improve glycemic control, delay the need for antihyperglycemic drug therapy, and decreases CV risk factors (systolic blood pressure, TC, HDL-C, TC:HDL-C ratio, and TG) in type 2 diabetes. The DASH dietary pattern does not target sodium reductions but rather emphasizes vegetables, fruits and low-fat dairy products, and includes whole grains, poultry, fish and nuts. It contains smaller amounts of red and processed meat, sweets and sugar-containing beverages, total and saturated fat, and cholesterol, and larger amounts of potassium, calcium, magnesium, dietary fibre and protein than typical Western diets. A systematic review and meta-analysis of 4 trials of the Atkins diet and one trial of the Protein Power Lifeplan diet (a diet with a similar extreme CHO restriction) showed that these diets were no more effective than conventional energy-restricted, low-fat diets in inducing weight loss with improvements in triglycerides (TG) and HDL-C offset by increases in total cholesterol (TC) and LDL-C for up to 1 year. The Protein Power Lifeplan diet, however, did show improved A1C compared with an energy-reduced, low-fat diet at 1 year in a subset of participants with type 2 diabetes. A common finding across most of the available trials involving popular diets, such as Atkins, Ornish, Weight Watchers, and Zone diets, was poor dietary adherence, although greater adherence was associated with greater weight loss and reductions in cardiovascular risk factors irrespective of the diet. More studies conducted specifically in people with diabetes are warranted for these diets. Studies have found that diets high in dietary pulses, either alone or as part of low-GI or high-fibre diets, can lower fasting BG and/or glycated blood proteins, including A1C, in people with and without diabetes. Such diets may also increase HDL-C, and reduce TC and LDL-C. The consumption of nuts may be used as a replacement for CHO foods in people with type 2 diabetes. Two ounces of mixed, unsalted nuts daily (or 50 to 75 g, depending on individual energy needs of participants) for 13 weeks in people with type 2 diabetes lowered A1C, TC and LDL-C with no decrease in HDL-C, resulting in an improved TC:HDL-C ratio and no concomitant weight gain. In 1 pilot study in people with type 2 diabetes, five 28 g servings of almonds per week for 12 weeks resulted in improvements in A1C and BMI. In another study, 60 g of almonds per day for 4 weeks, compared to a National Cholesterol Education Program (NCEP) Step II diet, in people with type 2 diabetes, improved fasting glucose, percentage of body fat, TC, LDL-C and LDL-C:HDL-C ratio. People with type 2 diabetes should maintain regularity in timing and spacing of meals to optimize glycemic control [Grade D, Level 4]. Inclusion of snacks as part of a person's meal plan should be individualized based on meal spacing, metabolic control, treatment regimen and risk of hypoglycemia, and should be balanced against the potential risk of weight gain. People with type 1 diabetes should be taught how to match insulin to carbohydrate quantity and quality [Grade C, Level 2] or should maintain consistency in carbohydrate quantity and quality [Grade D, Level 4]. Intensive insulin therapy regimens that include multiple injections of rapid-acting insulin matched to CHO allow for flexibility in meal size and frequency. Acesulfame potassium, aspartame, cyclamate, neotame, saccharin, steviol glycosides, sucralose, tagatose and thaumatin have been approved by Health Canada for use as either table-top sweeteners or food additives, or for use in chewing gum. Health Canada has set acceptable daily intake (ADI) values, which are considered safe daily intake levels over a lifetime. Most have been shown to be safe when used by people with diabetes; however, there are limited data on the newer sweeteners, such as neotame and thaumatin. Stevia extracts are approved by Health Canada for use in foods and beverages. The ADI is set at 4 mg/kg/day of steviol. Intake of up to 1 g steviol glycosides per day was shown to be safe in people with type 1 or type 2 diabetes and was not associated with hypoglycemia or hypotension. Sugar alcohols (erythritol, isomalt, lactitol, maltitol, mannitol, sorbitol, xylitol) are also approved for use in Canada; however, there is no ADI (except for erythritol) as their use is considered self-limiting due to the potential for adverse gastrointestinal symptoms. Matching rapid-acting insulin to the intake of sugar alcohols is not recommended. Although there are no long-term, randomized controlled trials of consumption of sugar alcohols by people with diabetes, consumption of up to 10 g/day by people with diabetes does not appear to result in adverse effects. Thermal food processing at very high temperatures, such as frying, broiling and grilling, results in formation of dietary advanced glycation endproducts (dAGEs), a class of pro-oxidants of which 10% are absorbed. Meals high in dAGEs increase markers of endothelial and adipocyte dysfunction in adults wtih type 2 diabetes and impair vascular function. dAGEs can be reduced by cooking foods at a low temperature, preferably in liquid. This can improve insulin resistance in those with diabetes. Randomized controlled trials have shown that partial meal replacement plans yield comparable or better weight loss – leading to better glycemic control and reduced need for antihyperglycemic medication – as compared with conventional reduced-calorie diets up to 1 year with maintenance up to 86 weeks in overweight people with type 2 diabetes. Meal replacements have also shown benefit as part of ILIs. Overweight participants with type 2 diabetes during week 3 to week 19 on the ILI intervention arm of the Look AHEAD trial were prescribed meal replacements. Participants in the highest quartile of meal replacement usage were approximately 4 times more likely to reach the 7% and 10% weight loss goal than participants in the lowest quartile. However, meal replacement products designed specifically for people with diabetes have yet to show a clear advantage. The same precautions regarding alcohol consumption in the general population apply to people with diabetes. Alcohol consumption should be limited to ≤2 standard drinks per day and <10 drinks per week for women and ≤3 standard drinks per day or <15 drinks per week for men (1 standard drink: 10 g alcohol, 341 mL 5% alcohol beer, 43 mL 40% alcohol spirits, 142 mL 12% alcohol wine). Alcohol ingestion may mask the symptoms of hypoglycemia, reduce hepatic production of glucose and increase ketones. People using insulin or insulin secretagogues should be informed of the risk of delayed hypoglycemia resulting from alcohol consumed with or after the previous evening's meal [Grade C, Level 3] and should be advised on preventive actions such as carbohydrate intake and/or insulin dose adjustments and increased BG monitoring [Grade D, Consensus]. Moderate alcohol consumption (6 to 18 g/day) is associated with a 25% to 66% lower risk of total and fatal CHD in persons with type 2 diabetes and, consumed with food, does not cause hyperglycemia or hypoglycemia. Chronic high intake (~44 g ethanol per day) is associated with elevated blood pressure and TG in men with type 2 diabetes, while light to moderate intake shows an inverse association with A1C. People with diabetes should be encouraged to meet their nutritional needs by consuming a well-balanced diet. Routine vitamin and mineral supplementation is generally not recommended. Supplementation with 10 μg (400 IU) vitamin D is recommended for people >50 years of age. Supplementation with folic acid (0.4 to 1.0 mg) is recommended for women who could become pregnant. The need for further vitamin and mineral supplements needs to be assessed on an individual basis. If you would like more details on this topic, please visit the Canadian Diabetes Association Clinical Practice Guidelines: Chapter 11. Eating Well with Canada’s Food Guide can be found here.